Here’s what’s up in the world of TV for Monday, August 19. All times are Eastern. 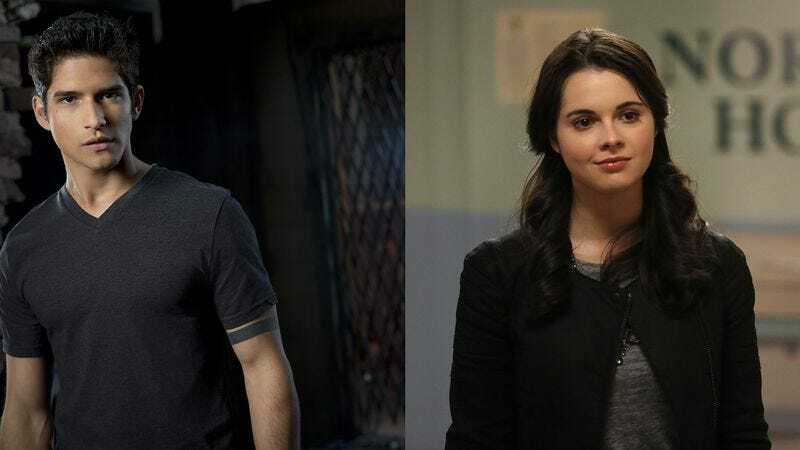 Switched At Birth/Teen Wolf (ABC Family/MTV, 8 p.m./10 p.m.): Two very different shows have finales tonight, and both will be back in a few months to follow up on whatever happens here. What we’ve been contemplating, however, is just what it would be like if the two shows somehow became one. Wouldn’t Switched At Birth be better with some teen werewolves running loose? And wouldn’t Teen Wolf be improved with a hyper-earnest tone and lots of family melodrama? Plus, then Carrie Raisler and Phil Dyess-Nugent could tag-team review every episode. It would be awesome! Under The Dome (CBS, 10 p.m.): By making two of the shows we regularly cover the mutual “top pick,” we have successfully reduced the amount of work we have to do in this section by a substantial amount. Which means we have no room to talk about Under The Dome. Sorry, Scott Von Doviak, but you’ll live. The IT Crowd (11 a.m.): One of this week’s episodes is called “Something Happened,” which… excuse us, but isn’t that the basis for almost all dramatic narrative? You might as well call your episode, “Some people get together and do some stuff and come in conflict.” Caroline Framke thinks that’s her life. Justice League (1 p.m.): The show offers a tip of the hat to SuperFriends and other animated superhero shows of its ilk with the young superhero team, the Ultimen, and Oliver Sava is going to spend way too long this week telling you how exactly every character there compares to all of the SuperFriends gang. Scrubs (3 p.m.): Season three comes to an end at Turk and Carla’s wedding, and our reviews come to an end for a while as well, thanks to the oncoming fall season. We’ve all had a time reading about this show, and Myles McNutt would like to thank you for not making fun of his ultra-sincere voiceovers. Delete (Reelz, 8 p.m.): It’s Seth Green versus the sentient computers in this miniseries that’s not afraid to ask the tough questions about our increasing reliance on electronic gadgets and gewgaws to get through the day. Like, namely, what would happen if Seth Green had to fight some sentient computers? Major Crimes (TNT, 9 p.m.): America’s favorite—okay, we may be using the term “favorite” very loosely here—Closer spinoff and Mary McDonnell star vehicle wraps up its second season by solving some very major crimes. Indeed, there’s a spree killer, which can only mean the stakes will be even higher. The Man With The 132-Lb. Scrotum (TLC, 9 p.m.): Yes, it’s time for a reality show all about the adventures of everyone’s favorite character, that wacky card, the man with the 132-lb. scrotum. When he learned we weren’t making him the top pick, he called out, “Guess you didn’t have the balls!” to us. Bubba-Q (Food, 10:30 p.m.): For those of you who’ve been agitating week after week in comments for a show about a team that builds custom barbecue grills, well, we heard your requests, and we talked to our good friends at the Food Network about them, and here you go. Here is the show you wanted. The Roommate (FX Movies, 8 p.m.): This movie is not very good. It doesn’t even embrace the inherent awfulness of its premise—one college roommate single white females her other roommate—to make for fun camp. It did, however, make us realize how much Leighton Meester and Minka Kelly look alike. The Tall T/Ride The High Country (TCM, 8 p.m.): It’s unsung Westerns night on TCM, with a couple of great, underseen oaters. The first is from the terrific Budd Boetticher, with Randolph Scott held captive. The second features Scott again, this time with Joel McCrea, and is directed by Sam Peckinpah. Monday Night Football: Exhibition: Steelers at Redskins (ESPN, 8 p.m.): Since it’s a Monday Night Football game—actually played on Monday instead of on Thursday—maybe RGIII will play, and you can check him out. But maybe he’ll sit it out to make sure that his knee heals properly. Who can really tell? Breaking Bad (Sunday): What happens after all of the things that happened in the midseason première happened? We can’t really tell you, because there are some who would say that us saying, “Things happened” is a spoiler. But Donna Bowman can let you in on those events, if you’ll read her review.